Weight loss isn’t a linear process. If you weigh yourself every day, then there will be days where the scale goes down, other days where it goes up. It doesn’t mean that the diet isn’t working, as long as the general trend is going downwards. Many people lose a lot of weight in the first week of low-carbing, but it is mostly water weight. Weight loss will slow down significantly after that initial phase. Of course, losing weight is not the same as losing fat. It is possible, especially if you’re new to weight lifting, that you are gaining muscle at the same time that you’re losing fat. To make sure that you’re losing, use something other than just the scale (which is a big, fat liar). Use a measuring tape to measure your waist circumference and have your body fat percentage measured every month or so. Also, take pictures. Take note of how your clothes fit. If you’re looking thinner and your clothes are looser, then you ARE losing fat no matter what the scale says. Bottom Line: Weight loss isn’t linear and there’s a lot more to weight than just body fat. Be patient and use other ways of measuring than just the scale. Some people are more carb sensitive than others. 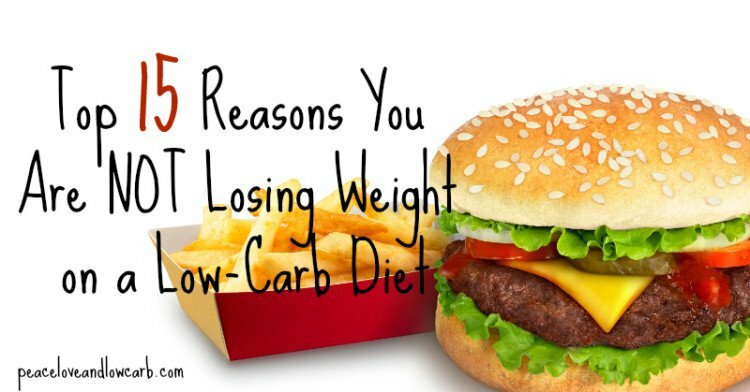 If you’re eating low-carb and your weight starts to plateau, then you may want to cut back on carbs even further. In that case, go under 50 grams of carbs per day. When you go under 50 grams per day then you’re going to have to eliminate most fruits from your diet, although you can have berries in small amounts. If that doesn’t work either, going under 20 grams temporarily can work… eating just protein, healthy fats and leafy green vegetables. To make sure that you’re really eating low-carb, create a free account on Fitday and log your food intake for a while. Bottom Line: If you are carb sensitive, then you may want to temporarily eliminate fruits and eat less than 50 grams of carbs per day. Unfortunately, it isn’t always enough to just eat healthy and exercise. We need to make sure that our bodies are functioning optimally and that our hormonal environment is favorable. Being stressed all the time keeps the body in a constant state of “fight or flight” – with elevated levels of stress hormones like cortisol. Having chronically elevated cortisol levels can increase your hunger and cravings for unhealthy foods (1, 2). If you want to cut back on stress, try meditation and deep breathing exercises. Cut back on distractions like Facebook and news media, read more books instead. Bottom Line: Chronic stress can have negative effects on your hormonal environment, making you hungrier and preventing you from losing weight. A low-carb diet is about more than just lowering your intake of carbs. You have to replace those carbohydrates with real, nutritious foods. Throw away all processed low-carb products like Atkins bars, they are not real food and they are NOT good for your health. Stick to meats, fish, eggs, vegetables and healthy fats if you need to lose weight. Also, “treats” like paleo cookies and brownies can cause problems even though they’re made with healthy ingredients. They should be considered as occasional treats, not something you eat every day. What is also important is to eat enough FAT. If you try to cut back on carbs AND fat, you will end up ravenously hungry and feel like crap. Eating a diet with nothing but protein is a very bad idea. 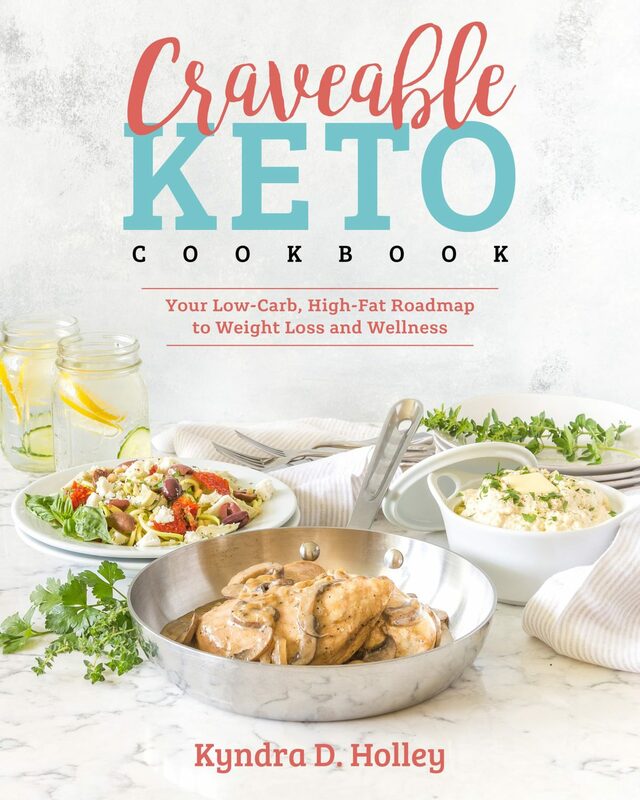 Low-carb, high-fat and moderate protein is the way to go if you want to get into ketosis, which is the optimal hormonal environment to burn body fat. Bottom Line: You need to replace the carbs with real, nutritious foods. To lose weight, stick to meats, fish, eggs, healthy fats and vegetables. Nuts are real foods, no doubt about that. They are also very high in fat, almonds for example having about 70% of calories as fat. However, nuts are very easy to overeat on. Their crunchiness and high energy density give us the ability to eat large amounts of them without feeling full. I personally can eat a bag of nuts and still not feel satisfied, even though that one bag contains more calories than a meal. If you’re snacking on nuts every day (or worse, nut butters) then chances are that you’re just eating way too many calories. Bottom Line: Nuts have a very high energy density and are easy to overeat on. If you’re constantly snacking on nuts, try eliminating them. Sleep is incredibly important for overall health and studies show that a lack of sleep correlates with weight gain and obesity. A lack of sleep can make us feel hungrier. It will also make us tired and less motivated to exercise and eat healthy. Sleep is one of the pillars of health. If you’re doing everything right but still not getting proper sleep, then you won’t see anywhere near the results you might expect. If you have a sleeping disorder, see a doctor. They are often easily treatable. · Avoid caffeine after 2pm. · Sleep in complete darkness. · Avoid alcohol and physical exercise in the last few hours before sleep. · Do something relaxing before sleep, like reading. · Try to go to bed at a similar time each night. Another low-carb food that can cause problems for some people is dairy. Some dairy products, despite being low in carbs, are still pretty high in protein. Protein, like carbs, can raise insulin levels, which drives energy into storage. The amino acid composition in dairy protein makes it very potent at spiking insulin. In fact, dairy proteins can spike insulin as much as white bread (7, 8). Even though you may seem to tolerate dairy products just fine, eating them often and spiking insulin can be detrimental to the metabolic adaptation that needs to take place in order to reap the full benefits of low-carb diets. In this case, avoid milk, cut back on the cheese, yogurt and cream. Butter is fine as it is very low in protein and lactose and therefore won’t spike insulin. You should NOT exercise with the goal of burning calories. The calories burned during exercise are usually insignificant, they can easily be negated by eating a few extra bites of food at the next meal. However, exercise is critical for both physical and mental health. Exercise, in the long run, can help you lose weight by improving your metabolic health, increasing your muscle mass and making you feel awesome. But it’s important to do the right kind of exercise. Nothing but cardio on the treadmill is unlikely to give you good results and doing too much may even be detrimental. Weight lifting – this will greatly improve your hormonal environment and increase your muscle mass, which will help you lose weight over the long term. Interval training – doing high intensity intervals is an excellent form of cardio that improves your metabolism and raises your levels of human growth hormone. Low intensity – being active and doing some low-intensity work like walking is a great idea. The human body was designed to move around, not sit in a chair all day. Bottom Line: The right kinds of exercise improve your hormonal environment, increase your muscle mass and make you feel awesome. Despite some sweeteners having no calories, they can affect our appetite levels. Several studies show that artificial sweeteners can affect appetite, either negatively or positively, in some cases making people eat more overall calories (9, 10). Additionally, consumption of artificial sweeteners is associated with weight gain in the long term (11, 12). This probably depends on the individual, but if you’re eating a lot of sweeteners and aren’t losing weight then you may want to try removing them. Bottom Line: Despite being calorie free, artificial sweeteners can affect our appetite, in some cases leading to a net increase in overall calories. There are certain medications that are known to stimulate weight gain. If you look at the list of side effects for the medications you are taking and see “weight gain” on the list – then make an appointment with your doctor. Perhaps there is another drug available that doesn’t cause weight gain. If you’re doing everything right and still aren’t getting results, then perhaps you have some underlying medical problem. Many hormonal disorders can cause problems losing weight, particularly hypothyroidism. In that case, make an appointment with your doctor. Explain that you’re having problems losing weight and that you want to rule out any medical issues. Bottom Line: Certain medical issues and medications can cause weight problems. See a doctor to discuss your options. It is a persistent myth in health and fitness circles that everyone should be eating many, small meals throughout the day. This has actually been studied thoroughly. No advantage has been found to eating more frequent and smaller meals (13, 14). It is natural for humans to eat fewer meals per day and sometimes go long time periods without food. Some people do something called intermittent fasting, eating in an 8 hour window each day or doing 24 hour fasts 1-2 times per week. This can be very useful to break through a plateau. Bottom Line: There is no proven benefit to eating many small meals throughout the day. Try eating fewer meals and consider giving intermittent fasting a shot. For people who are able to control themselves, having cheat meals or days every now and then may be fine. For others, especially those who are prone to food addiction, having cheat meals is likely to do more harm than good. If you’re cheating often… either with “small cheats” here and there or entire days where you eat nothing but junk food, then it can easily ruin your progress. Having more than 1-2 cheat meals per week (or one cheat day) is going to be excessive. If you just can’t seem to control yourself around unhealthy foods no matter what you try, then perhaps you have food addiction. In that case, completely removing the junk foods from your life is probably a good idea. Bottom Line: Some people can eat junk food from time to time without ruining their progress, but that doesn’t apply to everyone. For others, cheat meals will do more harm than good. At the end of the day, calories do matter. One of the main reasons low-carb diets are so effective is that they reduce appetite and make people eat less overall calories without trying. If you’re not losing weight but are doing all the right things, then try counting calories for a while. Again, create a free account on Fitday and track your intake for a few days. Aim for a deficit of 500 calories per day, which theoretically should make you lose 1 pound of weight per week (doesn’t always work in practice). At the end of the day, weight loss takes time. It is a marathon, not a race. Losing 1-2 pounds per week is a realistic goal. Some people will lose weight faster than that, others slower. But it’s also important to keep in mind that not everyone can look like a fitness model. At some point, you will reach a healthy set point weight, which may be above what you initially hoped for. Bottom Line: It is important to have realistic expectations. Weight loss takes a long time and not everyone can look like a fitness model. I don’t think it’s a good idea to be in a calorie deficit for too long at a time. The leanest people on earth (bodybuilders and fitness models) never do this. They do cycles of “bulking” and “cutting.” If you eat at a calorie deficit for many months (or years) then eventually your metabolic rate may slow down. If you’ve been dieting for a long time, then a two month period where you aim to “maintain” and gain a bit of muscle may be what you need to get things started again. Of course, this doesn’t mean eating bad foods, just more of the good stuff. After these two months are over, you can start “dieting” again. Thanks for that, this is really good advice for me…. I found I got to a point in low carb where I couldn’t seem to lose any more. Following a low carb diet that was ALSO high in healthy fats, and more moderate protein got the scale moving again. The body will convert excess protein to glucose too. I have to watch my fat to protein ratio. If i eat too much protein the weight loss slows down. Thank you! I lost 72lbs on low carb and I gained 25lbs back. I kept saying oh I will start low carb and the weight will come off again! Well I lost 10 and 15 lbs is holding on strong. Thanks for the article. It helped me figure out what I was doing wrong! Not drinking enough water. If I don’t drink at least 64-90 ounces a day, I will stall. I recently broke through a huge stall when I cut back on protein and increased my intake of the lowest carb vegetables.The breakthrough was when I realized that I was getting sleepy after eating just a protein lunch. I can literally see that areas on my body where I have excess fat are getting smaller! My midnight snack is now a giant green salad with cukes, radishes, raw cauli, fatty dressing and bacon bits. I thank Dana Carpender for helping me see the way with a ‘fat fast’ tryout, and trying to incoporate those principles in a more realistic regimen. Did you forget alcohol? I’ve noticed that many US authors disregard alcohol, wine, beer, spirits etc as if everyone was a non-drinker and alcohol didn’t exist. Unfortunately (or fortunately) it does, and alcohol is the way many anaesthetise themselves from the stressors of live, including the stress of their diet not working. Lots of people blame their diet whilst having one, two or three un-measured glasses of wine a night – seven nights a week. Thanks for the tips! I lost the first 17 pounds or so very quickly when I went to between 20-40 g of carbs a day, and then got stuck. I’ve been here at the same point for about 6 weeks now, so it’s really frustrating! I drink lots of water, eat healthy fats, but after reading this, I may not have cut my calories quite enough. Maybe I’ll try going between 40-50 g carbs but lower calories for a week or so and see if that gets the weight to budge. I’ve been at 20 g of carbs from the start and have been losing consistently. I believe 50 g of carbs might be the place to start to see if that gets you on track. Best of luck to you! #down30in60days. Thanks for the article. Reading the article and some of the comments makes me realize I have more to learn. One quick question: Does anyone know if there is an advantage to using FitDay over LoseIt or My Fitness Pal? I’m currently using My Fitness Pal to log my daily intake and exercise. I’d prefer not to sign up for a different program if it does the same as those I’ve mentioned. Thanks! I am on my second full month I lost 10 lbs the first 5 weeks now I am stuck,,been at the same weight for 3 weeks now. I do 18-22 carbs a day sometimes I am under sometimes a tad over, but I stay pretty consistent. I did one cheat day…felt like crap the next day that didn’t help either….I do seem to be losing inches but that scale needs to move…..ugghhhh. the only thing I am doing wrong is not exercising regularly..just can’t seem to get motivated. I’ll look into some of the other suggestions and let y’all know. While this may not be a popular response, for me, adding back in carbs such as sweet potatoes, oats, qunioa, rice, or legumes has actually helped me to lose weight. I used to eat super low carb (like 20g net carbs per day) but I constantly felt deprived and then it would cause me to cheat more often. Once I added back in a serving of one of those starches, I found I was a lot better off mentally as well as physically! Not only has it helped me lose weight but it also helped to regulate my monthly cycle, which got messed up when I ate super low carb (and I have PCOS so having a normal cycle is really important to me). I know now that my body needs a bit more carbs to function properly, and now that I eat those I don’t feel the need to cheat as often as I used to. I’ve probably tried every trick to break a stall–short of doing the egg fast thing (yuck! )–and I think I’ve pinpointed the reasons for my stall. Other than age/hormones (post-menopause) that naturally slows things down, I’ve simply been cutting the calories too low for too long. Second issue was getting involved with a group of MEAT MEAT MEAT (fat) eaters, who seem to thrive on massive amounts of protein, but I don’t. My weight loss crawled to just over 1 lb in 90 days, and that was without cheating once! A friend followed that plan and reached her goal, but she combined the diet with working out every day, built up to 2 hours of intense workouts–heavy cardio followed by weight training–so yes, she reached her goal and is as fit as can be, and now eats a lot more fat and less protein to maintain. It may work for some, but it’s most assuredly not for all. Exercise is drudgery to me. I’m not proud to say it but I had to admit it. I don’t enjoy cardio, weight training, yoga, any of it. I HAVE to do it, but I’ve yet to find that magic plan that makes me want to move and groove. I suspect the lack of motivation comes, at least in part, from discouragement over the long, long stall. (I did work out for a while until I was involved in an accident with some painful injuries. All healed now, but the motivation hasn’t returned.) I’ve toyed with my carbs, staying around 20g gross carbs for many months, in which I did fantastic… but then the stall hit. The other side of the coin is the superfat diet, where a person eats huge amounts of butter, coconut oil, and other healthy oil but in quantities so large that their body is only burning what they eat, and not burning body fat. So they maintain (that is, stall), or worse, gain weight. Finding the balance can be tricky. But one thing I’m glad to have learned is that I CAN have a BPC or a fat bomb if I want them and not have to feel like I’ve done something wrong or worry about getting kicked out of a group if I mention either of them. I’ve been doing low carb dieting for nearly 2 months now. I’ve lost 1st 5lbs but have struggled at times. When I previously was in one sliimming group I remember someone wasn’t losing weight and the leader suggested eating more, which surprised me but I have since tried that when dieting on my own and have found it usually works for me. 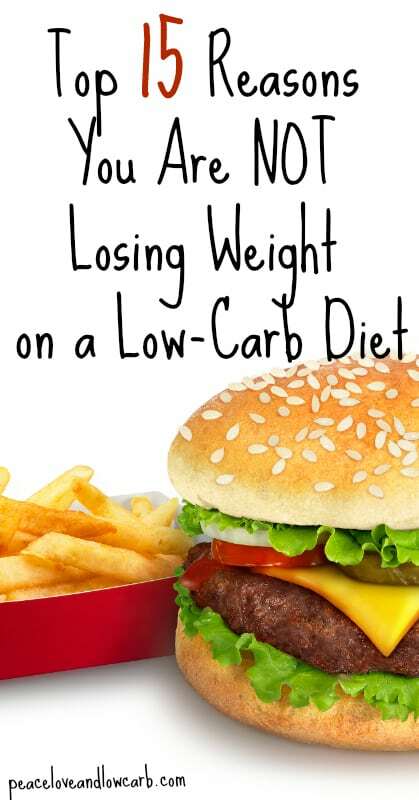 I have also tried that on this low carb diet and again, I’ve found it works to kick start the weight loss. Wow. I really needed to see this today. I switched to a LCHF way of eating almost 2 months ago and have only lost 10 pounds. While I realize that 10 lbs lost is nothing to scoff at, I say *only* because my son who has been eating this way for just a month has already shed 20 pounds. I began to feel discouraged but after reading your list I’m forced to realize that I am sabotaging myself in several different ways. I have been trying to “beat the system” by using no calorie sweeteners, eating low carb bread (which tastes like failure, heartbreak, and endless darkness by the way), and not taking very good care of myself overall (not sleeping, super stressed out). Thank you for the reality check. Now I am off to create a printable version of this list and tack it to my bathroom mirror for inspiration! Girl just what i need to keep me on track, because i have been a cheater for a few days, some good information, Thank you. ME TOO!!! I have to get back on track!! Hi have a sluggish thyroid which makes my weight high! -I’m a carb lover ,bread ,gravey,pasta is my weakness. Excess protein is stored like a carb and causes weight gain or plateaus. LCHFat is best for long term weight loss, longevity, cancer, dementia especially when coupled with Intermittent Fasting. Carb reqs- .6g/kg of lean body mass/day. Easy Peasy! I put my food into ketolog and I find I am having a hard time acheiving my macros percentages. I can keep my carbs on target (22g)but I cant seem to reach my fat intake goals (144)and almost always go over my protein goal of 87g (usually hit 100g) trying to get that fat in. I wish I could figure out how to make it work. any suggestions? Hi Karen I found that buying heavy whipping cream adding a bit of liquid stevia, vanilla , and 1-3 strawberries you have a great sweet treat that has more fat than protein. And I also found a dressing by Olive Garden in the store (yes restaurant kind) called Parmesan ranch, it’s really yummy on salads has fat and no protein so I eat a salad a day and get my fats in. Thank you for posting this article. It put me back on track. Ive been eating too many Atkins bars, I really didn’t know they were that bad for me. And I need to keep track of my carbs better. Try the app ” carb manager” . You can add the foods u eat, scan the barcodes of food, as well as search. It has most restaurant foods, and 90% of anything else I was looking for. All you do is set your % for carbs fats proteins and calories. Then every time u eat it keeps track of your day. So you know when you’ve eaten all the carbs you allotted for the day as soon as I log in what I just ate.. It’s extremely helpful and keeps u accountable! Good luck! Hi I’m trying to lose weight but I’m finding it really really hard to do at the moment.